Find and compare the best prices from a range of well known car rental companies at Zakynthos (Zante) Airport. This is a free to use facility, enabeling you to book direct with the company quoting the price. Zakynthos (Zante) Airport, otherwise known as Dionysios Solomos Airport, is located 6 Km south of Zakynthos town, on the south east coast of the Ionian island of Zakynthos, western Greece. Zakynthos is often refered to as Zante in English. The airport is situated on the south east coat of the island, 1km from the resort of Laganas and can be very busy on certain days of the week during the holiday period. A new departures area was opened in early 2008. Taxis are available and all parts of the island will be within approximately 25km of the airport. A taxi from the airport to Zakynthos town is likely to cost 12 Euros. 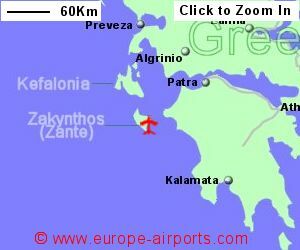 Zakynthos airport has 3 bars/cafes/restaurants, shop, a banking facility, and FREE WiFi Internet access. 1.6 passengers passed through Zakynthos airport in 2017, a 17% increase from the previous year.